The most infamous Nebraska showdown between settlers and cattlemen began in 1878 on the Custer County homesteads of Luther Mitchell and Ami Ketchum, located one mile to the south. Conflict arose when Ketchum's crops were trampled by cattle belonging to Isom Prentice (Print) Olive, who brought his herds from Texas to Nebraska's open range. After Ketchum had been implicated in stealing cattle, the Buffalo County sheriff deputized Olive foreman Bob Stevens to arrest Ketchum. The sheriff was not aware that Stevens was Print Olive's brother, wanted for murder in Texas under his real name, Bob Olive. On November 27, 1878, Olive and three cowboys rode to the Ketchum homestead, where gunfire erupted. Bob Olive was mortally wounded in the shootout and died three days later. After surrendering to authorities, Mitchell and Ketchum were briefly jailed in Kearney. On December 10, while being taken to Custer County for arraignment, the two were seized by Print Olive and his men and lynched in a rugged canyon near present Callaway. When the bodies were discovered the next day, they were also found to have been burned. 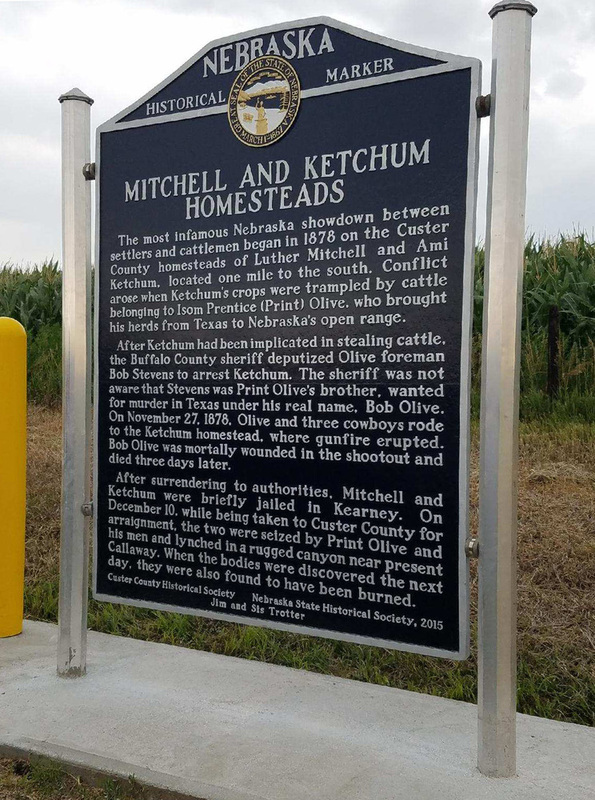 “Mitchell & Ketchum Homesteads,” Explore Nebraska History, accessed April 18, 2019, https://mynehistory.com/items/show/98.